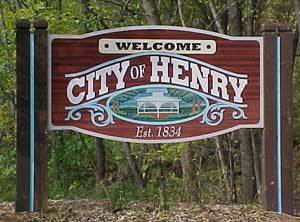 Henry was surveyed in 1834 and named after General James D. Henry when there were less than 100 inhabitants in the entire township. 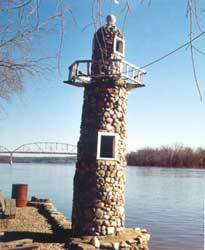 Those pioneers wisely chose a fine site on the beautiful Illinois River, which would never flood. By 1854, the area was filled with settlers who came by flatboat, steamboat, and covered wagon. Houses and buildings went up as fast as the carpenters could pound nails. In the early spring of 1854, Governor Joel Matteson signed our charter declaring Henry, Illinois a city. Since that time many exciting things have happened in Henry. Abraham Lincoln spoke here, we were an excursion stop for steamboats coming from Peoria, and our local baseball teams played both the Chicago Cubs and the White Sox. We were the home of "North Illinois University" and the Women's Seminary College. Charles and Edna Perdew did their wildlife carving and painting from their home overlooking the Illinois River. Their home and workshop are now in the process of being restored as a memorial to this renowned decoy carver. The river was used for commercial fishing and at one time was a gathering spot for shells for button making. The home of "Steamboat" Elsie Longman is located on the river here. "Steamboat" Elsie was instrumental in getting messages to the people on the barges traveling the Illinois, before the days of two-way radios. Henry has the distinction of having the first lock and dam built on the Illinois River, from which came one of our town slogans, "Best Town in Illinois by a dam site."